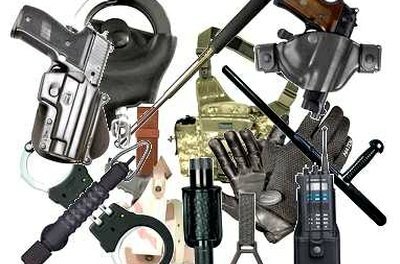 Whether you're a member of the military seeking to obtain equipment to supplement the gear you've been issued by your branch of the armed services or you're a security company in need of police-issue arms and supplies that are no longer being used, there are a number of avenues open to you. Your aims and ambitions are likely to be the criteria by which those in a position to give or donate items will determine your eligibility. But if you make an effort to contact likely sources and plead your case for a legitimate cause, you may just hit pay dirt. Contact your local police department to inquire about auctions, sales, and other liquidation events scheduled periodically by law enforcement agencies seeking to get rid of outdated or upgraded items. Once the events take place, there may be surplus goods and equipment remaining in inventory that is slated for donation. Prove your worthiness and you could wind up on the receiving end of what you're seeking. Contact larger agencies if you have no luck with local authorities. Viable avenues include the sheriff's department, the highway patrol, county officials, marshals, the FBI, Homeland Security, ICE, the CIA, and armed services military police forces. Follow the guidelines in Step 1 to approach these agencies about their donation policies following their individual efforts to liquidate, sell, or trade in their police equipment. Communicate with police equipment dealers at websites such as MachineGun.com. Obtain their guidelines for obtaining free firearms and other equipment. MachineGun.com has established the Guarantees Every Agency Results (G.E.A.R.) program, which gives away firearms and tactical gear to bona fide law enforcement agencies at no cost. These dealers are in the business of trading old gear, guns, and confiscated property for new firearms. Call 941-741-8282, send a fax to 941-741-8979, or visit their website (link below) and let them know what you are seeking. They may be able to help. Tap into the Law Enforcement Equipment Program (LEEP for America), which funnels free police gear to police officers in emerging democracies. They may be willing to help you out if you meet their criteria. Founded by Steve Newton, a Navy veteran and retired chief of police, LEEP is devoted to searching for used police equipment that can in turn be donated to Iraq's and Afghanistan's emerging police forces. If your need for batons, helmets, body armor, cuffs, vests, and weapons surpasses that of designated overseas police entities, contact Trish Benefield at TrishBene@bellsouth.net to find out whether you can benefit from LEEP's generosity. Research gun and police equipment trade and consumer shows in your area by reading magazines that attract advertisers in this arena. Merchants frequenting these types of shows may have policies that dictate donating a portion of their merchandise to worthy causes, particularly if they have stock that's not moving and they want to liquidate it. Additionally, contact police benefit organizations and auxiliaries to learn about programs to which they're privy. Take your request for free police equipment to benefactors and nonprofits by finding agencies willing to give your organization or group grant monies with which to purchase new or used police equipment. You'll be required to complete a lengthy grant proposal and provide rationales and background materials to support your case. But if you approach pro-military agencies and foundations, such as the NRA, you may be able to purchase the equipment you need without having to plead your case to those who may be in a position to help you out but are short on resources and equipment. Cohen, Gail. "How to Get Free Police Equipment." , https://legalbeagle.com/5208852-police-equipment.html. Accessed 19 April 2019.